US, 1992, 90 minutes, Colour. Voices of: Robin Williams, Scott Weinger, Linda Larkin, Jonathan Freeman. Directed by Ron Clements and John Musker. com­ing on strongly (vocally and visually) as the Genie. His stand-up comic patter probably requires a second viewing to catch the jokes and the impersonations as he continually shape-shifts. But the supporting characters are all fascinating, the evil Sorcerer and his bird, Aladdin's monkey, even the befuddled king. And there is a won­derful magic carpet who is a strong character without saying a word. On the other hand, Aladdin and Princess Jasmine are sweet and nice. Plenty of colour, movement and music, plenty of adven­ture and romance. Top Disney entertainment which led to a number of sequels for Television or straight-to-DVD. 1.One of the all-time Disney favourites? Its reputation? Popularity? 2.The 1001 Nights, the modern Disney version of the old story, language, jokes, showbiz – and the references for humour? 3.The style of the animation, the eastern city, the palace, the caves? The characters, nice, evil, jolly? 4.The musical score, the songs, the introduction to Aladdin, ‘A Whole New World’ …? 5.The story, the focus on Aladdin, the street thief, the lamp, the genie, the wishes, the princess and her fate, Jafar, the adventures, the comedy? 6.Legends and the storekeeper telling the tale? Aladdin, his age, on the streets, thieving, his friendship with Abu? The chases, meeting the princess, saving her? His arrest by Jafar, in prison? Jafar sending him for the lamp? The discovery of the genie? Their interactions? Wishing to be a prince? The spectacular entry into the city, courting Jasmine, not telling her the truth, the sultan being pleased, Jafar exiling him, the rescue by the carpet, confronting Jafar again, Jafar as sorcerer, his finally tricking Jafar, the happy ending with Jasmine, freeing the genie? The hero? 7.Jasmine, her suitors, her tough-mindedness, the law, her father and persuading him? Her sneaking out, going into the market, not having any money, Aladdin saving her? Jafar and his courting her? Her refusal? Prince Ali, her recognising him? Her upset about his stances? Tricking him into an admission? With her father, Jafar’s power, Aladdin’s return? 8.Jafar, his monkey, his voice, appearance, evil, his plans? The law? Advising the sultan, his staff and the snake, hypnotic? The advice to marry Jasmine? Wanting the lamp, sending Aladdin, the pursuit? Aladdin as prince? His control over him, exiling him? Getting the lamp, interactions with the genie, wanting to become the greatest sorcerer? Exercising his power? Being imprisoned in the lamp? 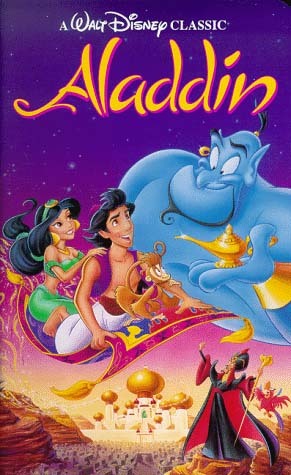 9.The genie and Robin Williams’ voice, the genie looking like Robin Williams? The talk and the patter, the jokes, the wishes, the variety of impersonations: Ed Sullivan, Robert de Niro, Jack Nicholson, Rodney Dangerfield …? The Groucho Marx impression? Other comedians? The use of television showbiz styles? A Robin Williams patter fest and impersonation? His role in the plot, the wishes, wanting to be free, finally freed? 10.The sultan, jolly, hypnotised, love for his daughter? 11.The court, the people in the marketplaces, the spectacular entry into the city? 12.The atmosphere of spectacle, the atmosphere of the east? 13.An entertainment for adults? For children?